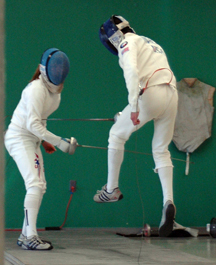 Whether you are new to pentathlon or an old hand at it, you are welcome to join us at the All Texas Athletic Center Fencing/Pentathlon Club in San Antonio, Texas. Our fencers range from beginners to Olympians, and every level in between. Our ages are just as diverse - from youth to veterans. Come join us in training. © 2015, All Texas Athletic Center, Inc. All rights reserved.